The Google Calendar integration lets you access, update and create new google calendar events from right inside of your helpdesk account. Each of your support agents can setup multiple google calendars and configure each with its own color. Hover the Google Calendar App and click on the view option. Note: This app does not require any global configuration. Each agent will have to authorize his/her calendar separately. Once you have successfully installed the Google Calendar app as mentioned above, you will then see the Calendar option appear in the navigation menu. Click on it. At the Top Right of the page, click on the drop down menu and select Settings. 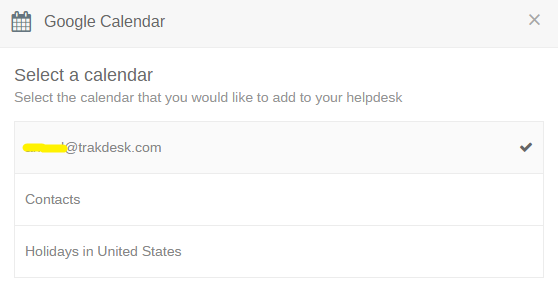 Click on the Add Calendar option to authorize google to sync your calendar events with your helpdesk account. Once the authorization process has completed, you will be prompted to select a calendar to sync. Note: If you have authorized multiple Google Calendars in your helpdesk account, it is important that you set the correct Default calendar in your calendar settings. By default, when viewing a ticket, your helpdesk will fetch events related to each specific ticket from the default Google Calendar you have selected. You can toggle between multiple calendars to view the events for each specific ticket. Finally, click on the checkbox to load the events for each Google Calendar you have authorized. 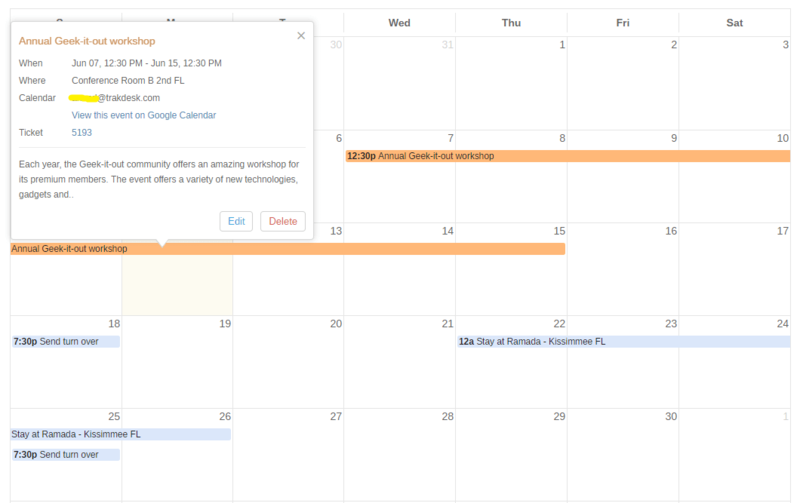 Adding events to your Google Calendar from the calendar view. You can add events to the calendar by clicking on Any available time slot in the calendar interface. Note: events that are added in the calendar view has no connection to tickets, and thus will not be visible in the list of events when viewing a ticket. Adding events to your Google Calendar when viewing a ticket. You can add events to specific tickets in your helpdesk by clicking on the Add Event option under the Events section in the ticket view. Note: events that are added to each ticket in the ticket view will be display in the calendar view. You can also update and delete the events as needed. 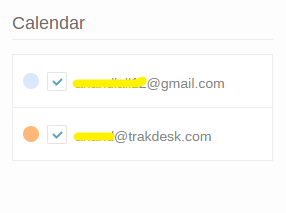 If you are one of our customers who have been using the old trakdesk calendar app prior to the July 23rd 2017 software update, we have depreciated the old app and replaced it with the new Google Calendar integration. This means, by default you will not see any of your old calendar events on the new calendar. Install the Google Calendar App. 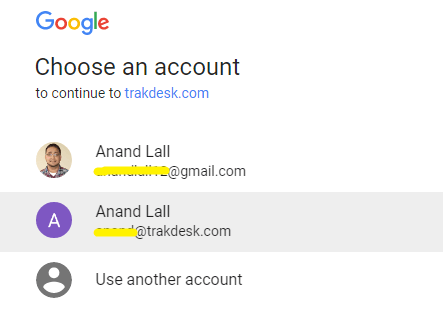 Authorize at least one Google Calendar with your helpdesk account. 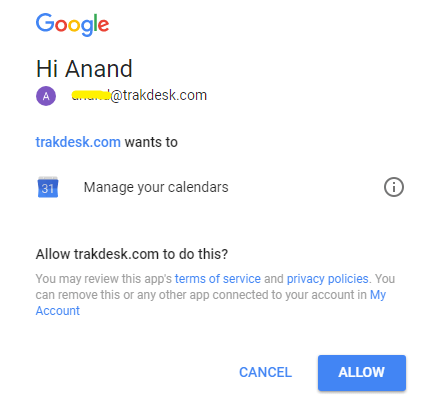 Go to https://yourhelpdesk.trakdesk.com/apps/google_calendar/sync . Replace yourhelpdesk in the URL with your trakdesk sub-domain. Click the Start button to start the sync process. Note: Once you have started the sync process, it may take a few minutes to sync all of your old calendar events. Please do not close your browser or reload the page while the sync is in process.